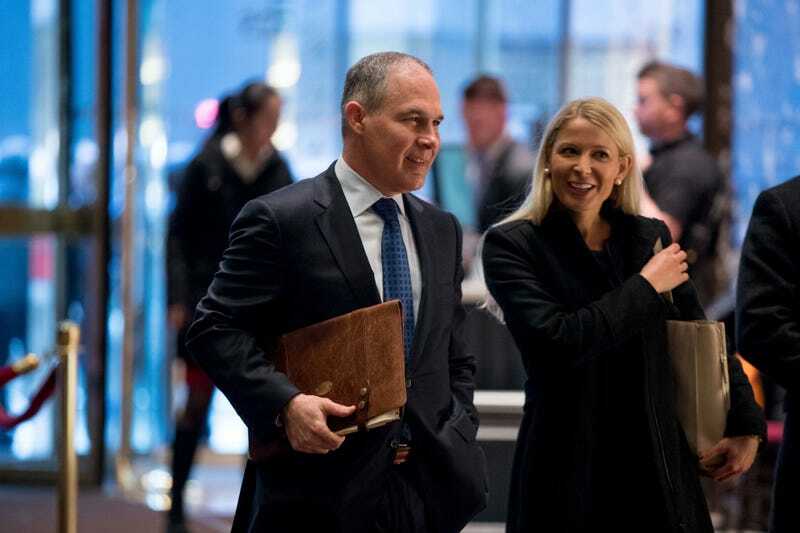 Donald Trump will name Scott Pruitt, the Oklahoma attorney general who formed an “unprecedented, secretive alliance” with the country’s fossil fuel industry, to run the Environmental Protection Agency, according to the New York Times. Pruitt has been fighting a years-long legal battle against Obama’s Clean Power Plan, joined in that effort by the energy companies whose businesses the Obama plan would regulate. In some cases, a 2014 investigation by the Times found, Pruitt sent letters, drafted by lobbyists, on state government letterhead, to officials in Washington—including the EPA. The Koch brothers-backed group Americans for Prosperity has supported Pruitt’s legislative efforts in the past, and Continental Energy CEO Harold Hamm, a longtime Koch associate, served as co-chairman of Pruitt’s 2013 re-election campaign. The pro-drilling and fracking Hamm, described by one Trump advisor as the “most influential” on the president-elect’s nascent energy policy, is reportedly being considered for energy secretary.